The choice of the tools for cnc machines is a somewhat delicate phase of the production process. 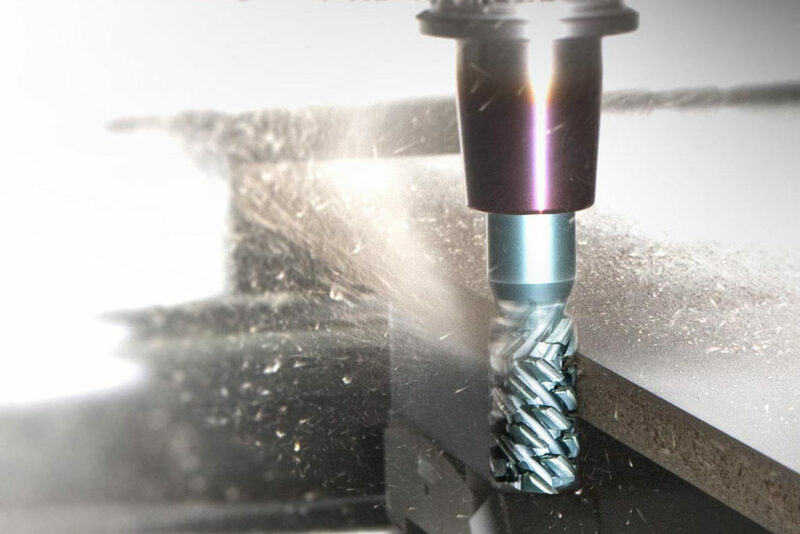 Very often our customers have a high-performance CNC but they use an unsuitable tool, or they're unable to obtain the required machining quality because of inexperienced operators, with the result that their entire production is jeopardised. In this article, we'll try to clarify some of the aspects for selecting the right type of bit. Firstly, we need to ask ourselves a few questions such as: what type of material do we want to machine? What machining operations do we have to carry out? How many panels do we have to process, and which ones? Let's take a look at these questions in more detail, because these aspects are important. Always remember, however, that the choice of tools is influenced by a number of variables linked to the specific machining operations to be performed and the needs of each individual user. 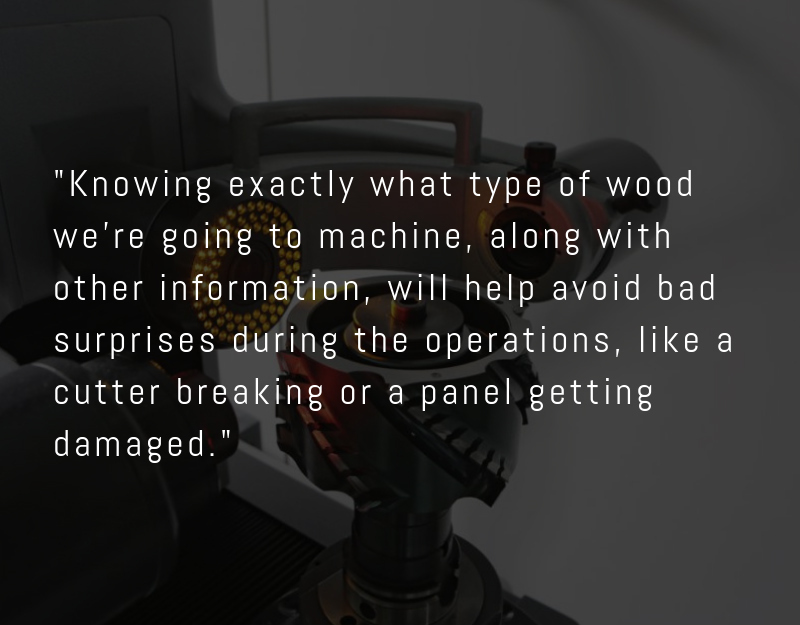 Knowing exactly what type of wood we're going to machine, along with other information, will help avoid bad surprises during the operations, like a cutter breaking or a panel getting damaged. Wood is a natural composite material that comes in many varieties and is used in a myriad of applications. Every wood has its own particular features: from the hardest to the softest, from pure to composite, from blockboard to laminate, whereas others, like chipboard, may contain wood/metal/glue waste, etc. 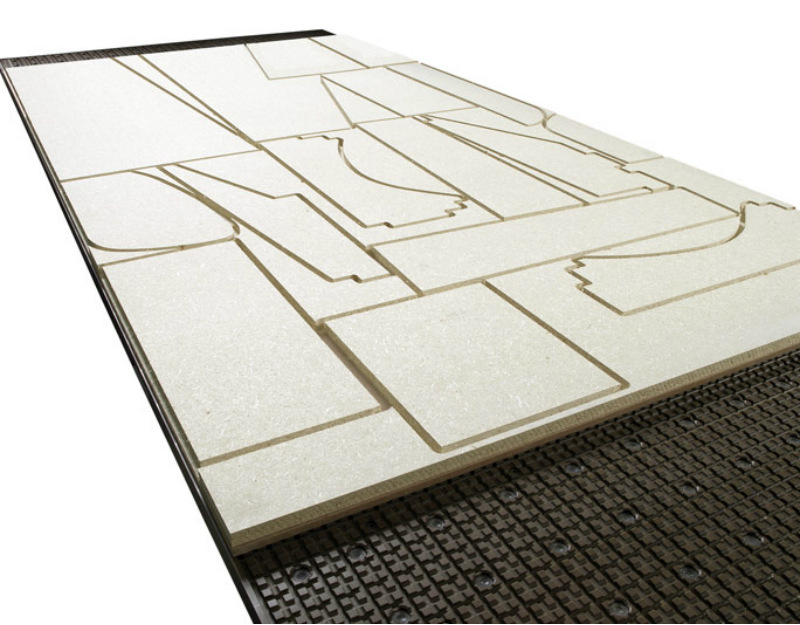 For example, if the panel we're machining contains ferrous materials, a polycrystalline diamond bit isn't suitable; it's highly recommended though, for working materials like Corian, highly abrasive materials, MDF, chipboard, etc. These variables dictate the choice of geometry for the cutting edge of the router bit which, as we'll see further on, can be of various types. The milling depth (i.e. how much chip material we need to remove) will affect the choice of the router bit shank. It's fundamental, however, to always remember that the type of machining operation has to be examined alongside other technical parameters too, such as the number of rotations and the feed speed; and one variable that must always be taken in consideration is undoubtedly the experience of the CNC operator. We've already mentioned some of the characteristics that distinguish a router bit for CNC machining centres, such as the cutting edge geometry, the cutting edge material and the material of the bit body. 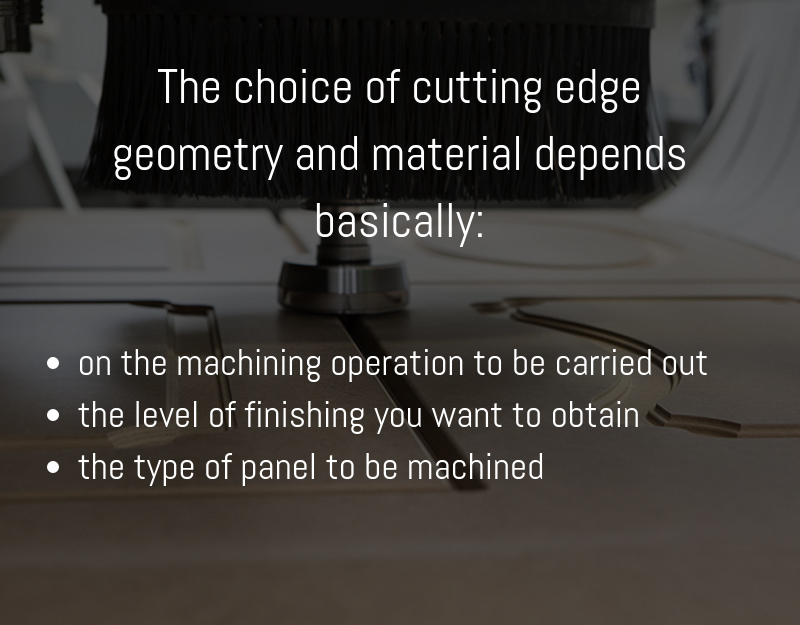 To simplify things, let's say that the choice of cutting edge geometry and material depends basically on the machining operation to be carried out, the level of finishing you want to obtain, and the type of panel to be machined (bearing in mind that every wood, as pointed out above, has its own specific characteristics). Remember that, generally speaking, the polycrystalline diamond is recommended for repeated operations thanks to its particular hardness, and it's highly recommended for certain materials; tungsten carbide (or solid tungsten carbide) is ideal for machining operations on hard materials. Summing up the information laid out so far, we can make a vital observation: there are numerous aspects and variables that can affect panel machining and consequently the choice of the router bit. That's why it's crucial to turn to an experienced tool supplier who has built up a detailed working knowledge of the materials and dealt with a variety of situations and specific machining requirements. on materials such as wood and wood composites, stratified materials and highly abrasive materials. The bodies are made of steel or solid tungsten carbide, with disjointed or whole tips. Wirutex hi-tech tools tungsten carbide router bits are suitable for contouring, sizing and shaping various types of material like hard wood and wood composites, solid wood and its composites, and laminated or plastic materials. Unlike polycrystalline diamond bits, where the tips are braze welded onto the cutter body, with tungsten carbide or solid tungsten carbide bits the cutting edge is part of the cutter body itself. In this case too, there are router bits with an HWM body and one, two or three cutting edges that, depending on the cutter model, may be straight or positive/negative helical to suit the type of application. 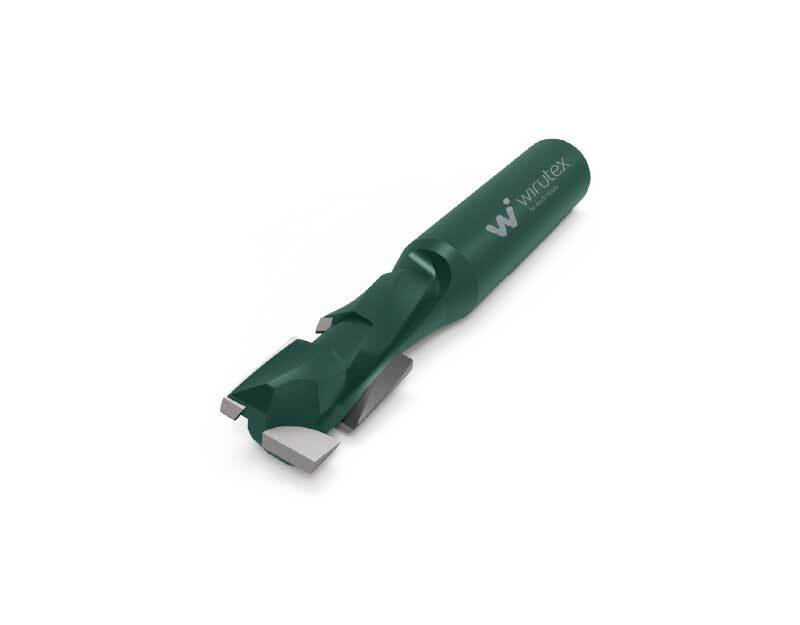 Wirutex hi-tech tools is a byword for reliability and experience built up in nearly 40 years of work. The quality of its tools in polycrystalline diamond and tungsten carbide is the result of continuing investment in technology and the painstaking control of the entire production process. Wirutex hi-tech tools' products are certified as complying with European Standard EN 847-1 and DGUV.